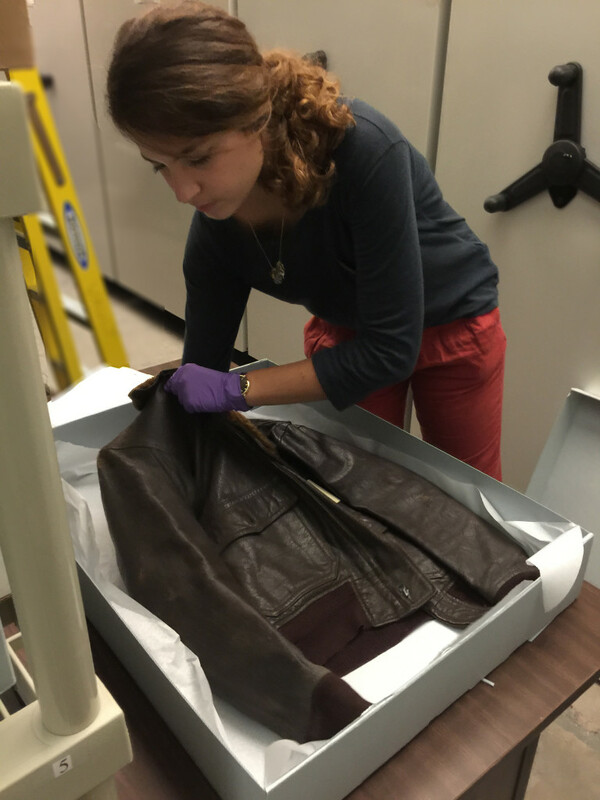 Museum Intern Elise Ventura at work in the Museum vault re-housing an A-2 flight jacket. The National WWII Museum is fortunate to have an extraordinary corps of over 250 volunteers and interns that offer valuable service and insight on a variety of projects and programs throughout our organization. Over the summer the Collections and Exhibits Department had the wonderful opportunity to host Elise Ventura, an intern through the French Heritage Society Exchange Program. Elise came to us from the Ecole du Louvre in Paris and was a huge help to us. Her primary project during her internship was the reorganization and re-housing of a portion of our flight jacket collection. Upon completion of her internship, Elise wrote about her experience here at the Museum in the following blog post. We hope you enjoy it. I had just graduated in art history, museology and collection care from the Ecole du Louvre in Paris and was looking for a summer internship abroad when I found out about the French Heritage Society Exchange Program. This American association, dedicated to the preservation of the French architecture in the United States, offered four internships in New Orleans. Among those internships was one at The National WWII Museum. Because of my family history and my personal interest for the era, this was the only internship that I applied for. Once I learned that I was selected, the Museum’s Collections Manager, Lowell Bassett, quickly got in touch with me to let me know I was accepted and that he would be working with me. On my very first day at the Museum, Lowell introduced me to the basic principles of preservation for textiles and leather and he gave me an overview of my particular project: The re-housing of a portion of the Museum’s flight jacket collection. Later that day I was given a tour of the storage vault by Larry Decuers, one of the Museum’s knowledgeable curators, who acquainted me with the history and models of the different types of jackets that I would be working with. The National WWII Museum owns a large collection of flight jackets of various models such as the A-2, 422-A, B-3, B-10 and B-15. These jackets made of poplin, leather, sheepskin and wool are very susceptible to damage from light, climate, and pests. For preservation and exhibit purposes their display within the Museum rotates quite often. Only a small portion of the collection is displayed in the different pavilions at any one time. The main venue for the jackets is in display cases among the “Warbirds” displayed in the Museum’s 26,000 square foot US Freedom Pavilion: The Boeing Center. The majority of the remaining collection of jackets is housed in climate-controlled storage in the Museum’s vault. As a summer intern, my mission was to locate various jackets in the different areas of the Museum’s vault, re-house those jackets in acid-free boxes and pad them with acid-free paper to avoid any hard creases or folds. Once the jackets were all properly stuffed and labeled as well as the boxes containing them, I was tasked with reorganizing a specific cabinet in the vault in which to store and consolidate them. I was also tasked with creating condition reports and reference photography of the jackets I was working with. To complete the process, I had to record all of these changes by entering the new information into the Museum’s collection management system, KE-Emu. Working in this amazing museum for two months and having the opportunity to handle such interesting items was an incredible experience for me. I was proud to take part in the preservation of these flight jackets. The whole project became an engaging history lesson on these particular museum artifacts. I learned that the jackets originally were created as standardized military uniforms and many became mediums for the young airmen’s colorful personalities. 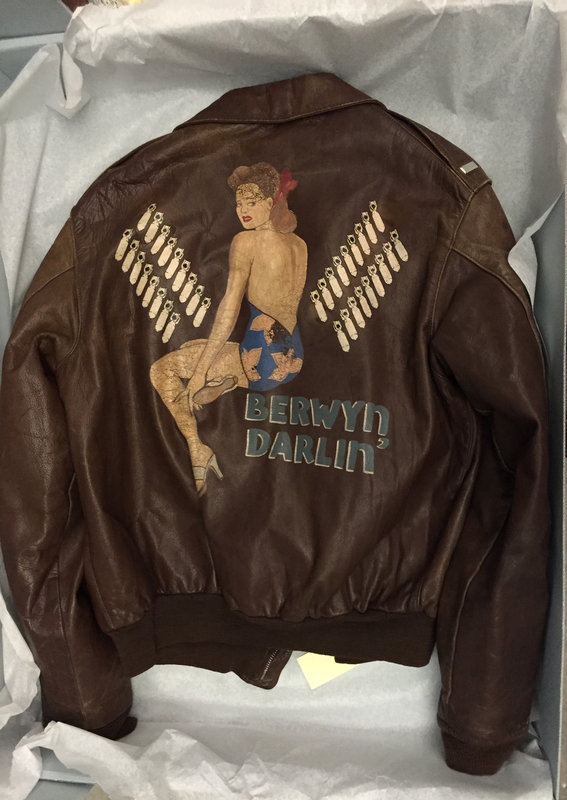 Jackets were sometimes personalized by their owners with leather patches indicating the squadron or bomb group they were in and some had amazing designs on the back featuring pin-ups, cartoon characters, planes and bombs. It would seem that familiar cartoons, glamorous pin-ups and names of loved ones were meant to give the airmen a sense of comfort and reassure them during their missions. Other, more menacing images, such as pirate flags or ferocious animals might be seen as magical charms for protection and strength during the sorties that claimed so many lives. The rarity of the highly decorated A-2 is hard to stress: While over 1,000,000 A-2 jackets were produced during World War II only 10-15% depicted images of art or patches. Of that number only a small portion survived the war and made it to present-day collections intact. A-2 Flying Jacket of 1st Lt. Armando J. Sinibaldo painted on the back with pin-up girl and 35 bombs along with Berwin Darlin’. The front left chest is painted with “A.J. Sinibaldo” and has a leather sewn-on patch for the 91st Bombardment Group. Gift of the Sinibaldo Family. 2013.230.001. Throughout my internship I was constantly reminded that these “men” who fought and died for their country in World War II were extremely young and their customized jackets were often a symbol of their young age. After being stripped of their identities and individuality in training, many expressed their youth and sense of humor on these jackets and often on their planes (many nose art images were painted by the same artist as the jackets). Following the bombing of Pearl Harbor in December 1941, many civilians enlisted in the military increasing the personalization of the jackets with motifs of American pop culture. The war would mark a heavy toll on these young airmen. Losses were so heavy during the early years of the War that from 1942 to 1943 it was statistically impossible for a heavy bomber crew in the 8th Air Force to complete their 25 mission tour. By the end of World War II over 40,000 airmen had been killed in combat theater and over 23,000 aircraft had been lost. Having the opportunity to work with a portion of the flight jacket collection and learning about the jackets’ owners was a real honor and extremely touching. One of the most memorable and emotional parts of my internship was having an opportunity to meet one of the families of one of the veterans. One day, as I was working in the vault, Lowell asked me to retrieve an A-2 flight jacket for a veteran’s family who stopped by the Museum. The family wanted to see the jacket their grandfather had donated a few years earlier. We presented them with the jacket and it was one of the more beautiful examples I had worked with during my internship. The back of the jacket depicted a gorgeously rendered pin-up as well as 30 bombs indicating 30 combat missions. The family was delighted to see that the jacket was being well taken care of and that it was being treated as both an artifact and artwork. They commented on the respect that was being shown to its previous owner their grandfather and how well it was being preserved in the Museum’s vault. I came to realize that the re-housing project was not just about preserving the flight jackets but above all about preserving the memories of the young and brave airmen who wore them. In the end I think the true goal of my project was to help to make sure that these wonderful pieces of history were properly stored so that they could tell their stories to future generations. The internship with The National WWII Museum was an invaluable experience for me. It provided me with an opportunity to learn more about World War II in an extraordinary setting with a rich collection. It inspired me to pursue my studies in collection management and perhaps apply for a position abroad in the future. Thank you very much National World War II Museum for this incredible opportunity!